A “first” credit card can be exciting, tempting and intimidating. Credit cards are a great convenience, but they are also a huge borrowing responsibility. Here are some ideas to keep in mind as you get your first credit card and begin to use it. Fees include annual fees which can vary from zero to $75 per year. Ideally, you would want to choose a card with no annual fee. There are also fees that issuers charge for late payments. Be sure to check the terms of the credit card agreement, especially if you may occasionally be late with a monthly payment. Interest rates can also vary greatly and can exceed 20%. Be very careful of low “teaser” rates, or special rates for a limited time if you transfer balances from another card. The rate after the special rate expires may be higher than you currently pay. Another way issuing companies increase the amount you pay is by how they calculate the interest. Be sure to read the details of the agreement. Rewards cards offer benefits for using the card. Using a credit card can bring the rewards of airline mileage, discounts on travel, points toward retail purchases and other benefits. A rule of thumb is that the benefits are usually worth about 1% of the charges. If a card with these types of benefits is important to you, make sure the benefits are ones you will use and that the interest rate and fees of the card do not offset the benefits of the rewards. Card A – No annual fee, 18% interest, no benefits for using it. Card B – No annual fee, 12% interest, mileage benefits for using it. Card C – Annual fee of $50, 10% interest, discounts on electronics for using it. As you can see, the differences are substantial. The differences become even more pronounced if the unpaid balance or amount of usage is higher. The example above is quite simple and the cards are not meant to represent actual cards offered by any institution. Be sure to read and understand the terms of any credit card before accepting it. 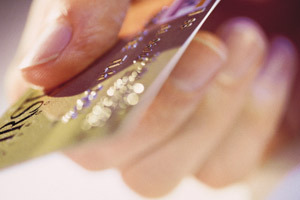 Be sure your credit card provides the right combination of fees, rates and benefits. If you do not carry over balances and pay finance charges, you might be willing to accept a card that has high rates and maybe even an annual fee, if the benefits were your main focus. However, if you normally pay finance charges or interest, pay extra attention to the interest rate. Keep the credit limit low. Depending on how you are going to use it, $500 or $1000 is high enough for most first-time credit card users. This will prevent you from spending more than you can pay back.